Welcome to my stop on the Ellen Hutson release bloghop! I am delighted that I was sent the Mondo Hydrangeas….because I was itching to watercolor some big flowers with my Daniel Smith tube paints…and this was the perfect excuse! Affiliate links may be used. Read more. The bigger the blooms, the better, right? Especially when working with watercolor – if you’re new to it, bigger blooms have more area for you to get used to pushing around the paint. If you’re new, don’t try that solid background though – yeesh, I was worried for a while that I might have to scrap it and start over! Watch the video below or click HERE to see it in HD on YouTube. For the sentiment, I used the Totally Fabulous die set – I cut the totally from vellum and made it along a banner, and attached the fabulous – I put some Be Creative tape on the back before diecutting, which made it nice and sticky to attach to my card! The entire new release is below – check it out and see all the awesomeness ahead! And, yay!!! I get to give away an Essentials by Ellen stamp set! The winner may chose ANY Essentials by Ellen brand stamp set (maximum value $15) currently in stock at Ellen Hutson.com. To enter my giveaway, please leave a comment on this post by February 19th! There is also a crazy awesome Grand Giveaway in the CLASSroom! To enter, be sure to leave a comment THERE, also by February 14th; ALL winners will posted at the CLASSroom the week after! Sandy Allnock <—- that’s me! I love the way you painted those hydrangeas! I’ll be watching this a few times! Thanks for sharing your talent. Those flowers are so pretty! You always do such incredible work, and I always learn so much from watching your videos. Thanks for the inspiration. You created a mini work of art! I love this stamp set. Gorgeous card–as usual! Love it! Oh my goodness what a beautiful card. Thank you so much for the tutorial and I am going to give it a try since I already got that wonderful Hydrangea Stamps. Just gorgeous! Thanks for a chance to win! Really enjoyed your demo and the results. Thank you for sharing. GORGEOUS, as always~~~ Love it! Fabulous is not even close-UBER fabulous is a better description of this stamp set, technique and card. Love it! I’m inspired to keep at my watercoloring. I have finally decided to brave watercolors and am so glad to have such a beautiful example to aspire to. Just gotta master the very basics first! what a beautiful card sandy!! As always, your card is TOTALLY Fabulous! You never disapoint! You make it look so easy…but I get out my little set and our cards have nothing in common. I’m trying to make cards with WCC women &children in crisis and they have so much fun and learn to let their walls down as they make cards for the Children Cancer Wing so I will trudge along and pay it forward. The card is fabulous we shall see what supplies my check book can buy..I wish the whole release but learning lots of cool things. Thanks!! I have always loved watercolor flowers and these are outstanding. Your painting skills are outstanding! This is a gorgeous card! Thanks for sharing! Wow, they totally looked as if you had done them from scratch with watercolours. Lovely. 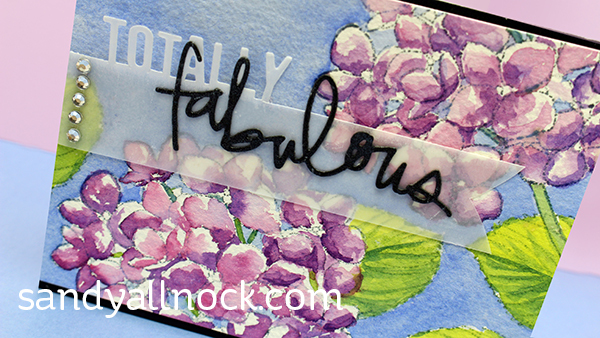 The hydrangea is gorgeous and I love that vellum strip with sentiment die! 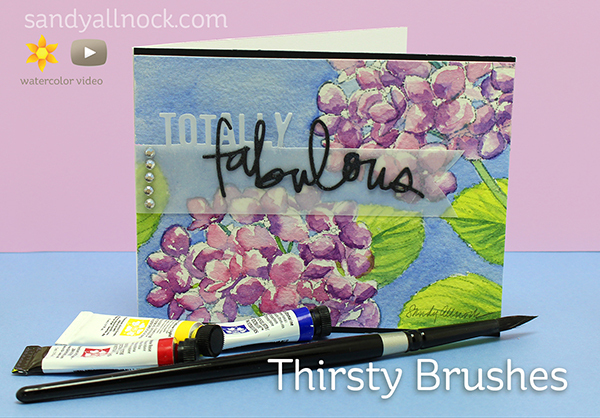 fabulous card, fabulous hydrangea stamp set, fabulous watercoloring . . . thanks! I always enjoy and am inspired by your work, and that includes this hydrangea! Your watercoloring just gets better and better every day! I love the way you painted these gorgeous hydrangeas. Like the Hydrangea. The creation looks like an artist canvas. The vellum is a nice addition. Have a BEE-utiful day! Wow, those flowers are so full of color and happiness! Thanks for sharing your talents with us. Your card is gorgeous! I had never heard of a thirsty brush before but I’m so checking them out tonight! Thank you for sharing your talent! Wonderful imperfect watercolor look that makes it oh so perfect. Loved watching your technique on these. Made me feel less intimidated by my watercolours. You are a great teacher Sandy! Love how you painted those flowers, so pretty! 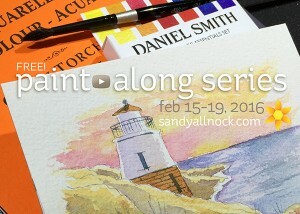 You have convinced me ~~ Getting my watercolors out of hibernation!